Home / Deals / Online Deals / Amazon Deals / Special K Bars $1.96/Box Shipped! Check out this Special K Coupon available at Amazon for an additional 25% off of Special K Products! Shop now and “clip” this Special K Coupon for 25% off of Special K Raspberry Cheesecake Bars! Get a 6-pack of 6-count Raspberry Cheesecake Bars for $16.49. If you shop through Subscribe and Save you will save an additional 5% and Free Shipping! That brings your total down to $15.67 Shipped! Clip the Amazon Coupon located on the same page for 25% off, which drops your price down to $11.75, or $1.96/Box Shipped! 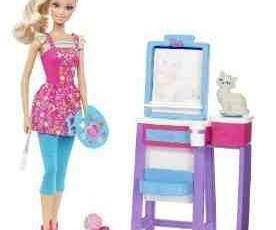 Barbie Art Teacher Set $13.15!